All of the above styles make 29LT Bukra the biggest multilingual Arabic and Latin typeface to-date. Contemporary geometric letterforms drawn with extreme refinement and sleek structure that unveils the bold and clean 29LT Bukra typeface. Its modern simplistic form makes all of its typographic styles suitable for a wide range of design applications. Corporate identities benefit from the fonts’ clean and polished outlines; while strong headlines and slogans profits from the fonts’ crisp structure. In big size, it works well in display type applications, while in small size it can be applied for short content text. The light weights of the type family give the notion of elegance and refinement, while the heavy weights imply strength and seriousness. Furthermore, the condensed styles are narrow and tall while the wide styles are round and heavy. It’s a type family with endless visuals representations allowing it to be applied in an infinite number of graphical applications. Bukra Standard is a type family created for maximum legibility and ease of use. The Arabic letterforms were designed based on the Abbasid & Modern Kufic styles with large open proportions and short ascenders and descenders cut to a minimum length. Whereas the Latin character set was designed based on the Geometric Sans Serif structures with a large main body height and minimalistic and original design aspects that lends the typeface a unique feel and a futuristic structure. After all, Bukra means ‘Tomorrow’. Bukra Slanted fonts are categorized as what is known as “true Italics” in the sense that the glyphs were redrawn based on a new design approach and not just slanted from the Standard fonts. The Arabic Slanted is based on the Eastern Kufic style since the Arabic Standard is based on the Modern Kufic style. The Eastern Kufic style is written with a left incline in the pen and contains straight diagonal letterforms and cuts. Comparing the Standard and Slanted character set, most glyphs changed radically between the two sets while others just acquired a slant. The name “Slanted” was adopted instead of “Italic” for the inclined styles because in Arabic typography and calligraphy there is no such term as an italic style. Straight and round structures define the Standard styles while diagonal and edgy structures outline the Slanted styles. Both answer the same design approach while being strictly distinctive from each other. Like all of 29LT fonts, many elements bring the Arabic and Latin scripts together, whether it’s the design approach, or the use of open counters, the proportions, or the terminals, finials, weight and contrast. We created both scripts in synergy and allowed them to be inspired by each other and be inspired by them ourselves, as we are sure you will be as well. The story of Bukra started in 2007. Pascal Zoghbi was contacted by Dr. Huda AbiFares to collaborate with her on the creation of a new Arabic font for “Ibn Battuta Mall” in Dubai, UAE. The client was asking for a strong and bold Arabic font to echo Futura Extra Bold typeface. Since Future is a geometric sans serif font, Zoghbi started looking for inspiration into Arabic calligraphic styles that are structured and geometric within the Kufic realm. Eventually a black geometric font immerged with extremely small counters and heavy geometric black pen strokes. This design aspect achieved the desired feel and look the client was asking for and granted the mall a distinctive visual identity and a sharp voice. The font was used as the main display type on huge banners informing the visitors about the latest deals and slogans of the mall. Additionally, it was used for all print applications such as ads, posters, fliers alongside online visual graphics on their website. After 5 year in 2012, 29Letters was launched as an independent digital type foundry and 29LT Bukra was one of the first published typeface. Zoghbi embarked on the development of the Arabic character set to cover Arabic, Farsi and Urdu scripts; while Swiss Typefaces, 29LT design partners, took on the challenge of creating a new open feel Latin companion. During this time, the type family grew from 1 to 5 weights and it covered all Middle Eastern, North African and European languages. In 2017,5 years after the first release of 29LT Bukra typeface, 29LT took on the challenge of growing the type family from 5 to 10 weights and they expanded into 5 width categories, growing the type family from 5 to 47 styles. The development of technology with the additional support of the Arabic script in the past 5 years required a complete transformation of the old font files into newly developed ones using the latest type design software. The main character set was revised and updated to cover more languages, and a set of ligatures and stylistic sets were added to the Standard set. After the creation of the 10 new weights in the Normal Bukra set, the time came to think about what would be the best way to approach the Condensed and Wide versions of the type family. New design decisions were needed to guaranty a smooth transition between the 5 different width categories while keeping the same typographic characteristics across the type family. The letterforms in the condensed styles were drawn in a slim and elevated manner, as opposed to the letterforms in the wide styles which were drawn in a curved and plump manner. 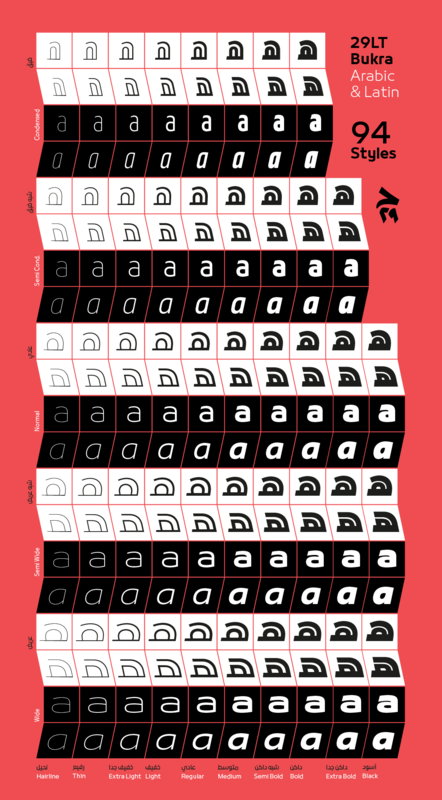 Eventually, the type family grew from a basic standard set of weights into a unique type system covering different weights, widths and design variations granting the type family a huge array of design possibilities in graphic applications. In addition to the expansion of the weight and width axes of the type family, the new fonts include advanced typographical support with features such as ligatures and stylistics sets inspired from calligraphy to improve the legibility of the fonts. The number of glyphs per font grew from 550+ to 1000+. Once the Standard 47 styles were developed, another set of design decisions was needed in order to create the slanted sets for both the Arabic and the Latin. In order to make these decisions, Zoghbi conducted a research about Arabic and Latin scripts to answer the design problems they faced. After several slanted design trials were conducted for both scripts, we opted for a hybrid Geometric Gothic solution for the Latin and an edgy hybrid Eastern & Modern Kufic for the Arabic. In result, the Bukra type family grew from 47 to 94 styles. 1 to 5 to 47 to 94 over the past 10 years! Pascal, what a fantastic post. You continue to innovate as always.